The CyberPower CP685AVR UPS is the ideal unit for basic to mid-level computer systems. The 685AVR not only guards against surges, spikes, sags, and brownouts, but also protects your computer system and valuable data during a power outage. The Automatic Voltage Regulation (AVR) monitors incoming AC power and regulates output to a smooth, consistent 120 volts. This model also has full dataline protection: RJ11/RJ45 (phone, fax, Ethernet, network, DSL) and RG-6 coax (DSS, cable modem, satellite, cable TV). 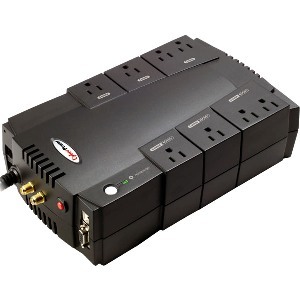 PowerPanel PE (TM) Power Management supplements the backup/surge protection by monitoring the vitals of the UPS and safely shutting down your system in event of a power outage. The standalone designs allows for vertical, horizontal, or wall mount. Surge-Only outlets are perfect for the addition of peripherals such as monitors, printers, scanners, iPods, or CD/DVD players. Lasts. Got 1 years ago. Still working. My son is using that one. This one is for the wife. It really lasts! Could use a few more outlets.